A superhero, a Spartan, a spy, and a prince highlight Gameloft’s 2010 E3 previews. Gameloft, one of the bigger names in the mobile market, showed selected members of the press its latest line of graphically impressive iPhone and iPad games at E3 this week. In the coming months, Gameloft will release the sequel to its critically praised hack and slash adventure game, Hero of Sparta ( ). 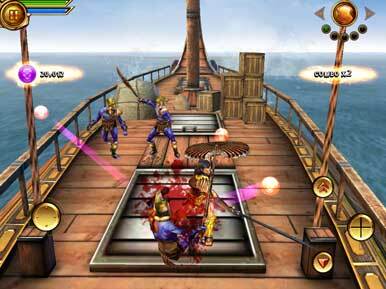 Though no release date has been set, Hero of Sparta 2 has been confirmed for both the iPhone and iPad. In Hero of Sparta 2, the plot follows Argos after his journey home to his beloved homeland. A vengeful Hades has cursed the Spartan and so he finds that everything that he has known and loved has been destroyed. Now, to seek revenge and lift the curse, Argos will once again have to draw swords and slaughter many Grecian mythological beasts and demons. By the look of the early build of the game, the game looks to play similarly to the original. The graphics on the iPhone looked similar to its predecessor, with maybe a slight improvement in the details of the characters. Once again, quick-time events factor heavily into performing finishing moves on particularly tough beasts. In the demo, I grabbed a demon carrying a particularly large sword and impaled him repeatedly with my own very large sword. For those who enjoyed the iPhone version of Splinter Cell: Conviction ( ), Gameloft is bringing the stealth action to the iPad. The game plays similarly to the iPhone version, but the iPad version features better graphics and a less cluttered screen. The demo I tinkered with proved that I still can’t master the game’s cover system, but Splinter Cell did look to be a better fit on the iPad than on the smaller iPhone. Yet, like many iPad games that make the jump from the iPhone, pixelation and detail loss are unfortunate drawbacks of the larger screen. In a departure from the usual 3D style embodied by Gameloft titles like Splinter Cell: Conviction and Hero of Sparta, Ultimate Spiderman: Total Mayhem reflects the comicbook style of the hero’s roots. In Total Mayhem, you control the web crawler as he battles criminals and super villains all over New York. You’ll get to punch, jump, shoot webs, and web swing just like the iconic hero. I was particularly impressed by the graphics of Total Mayhem, as the art style really is true to the Ultimate Spiderman comics. The gameplay is pretty varied too; in the demo I took out several villains with punches and webbing before I built up an “ultimate” attack and took out a huge group of them. Afterwards, my “spider sense” was triggered and I had to negotiate a quick time event to avoid an incoming truck driven by the nefarious Sandman. It was impressive how seamlessly the different segments in the game blended together. Still, there’s some room for improvement. I’d love swinging around the city using Spiderman’s webs, but I hated that it was kept to a scripted series of quick time events, rather an open world environment. Still, Ultimate Spiderman: Total Mayhem looks to be just about the best superhero themed game in the App Store and its art style and nods to the source material should make fans of the series happy while the intuitive gameplay should beckon newcomers. In addition to providing applications in the stealth and brawler genres, Gameloft is producing some new tittles in the platformer genre as well. Prince of Persia: Warrior Within was originally released on consoles in 2004 but is getting its own iPad version in July of this year. Combining swashbuckling action with jumping, dodging, wall running, and other acrobatic moves, Prince of Persia: Warrior Within looks to be one of the more complex games Gameloft has ever produced. The Prince of Persia series is renown for its difficulty, and Warrior Within is no exception: simply getting across a room would often require the player to wall jump, backflip, dispose of several demonic guards, and then maybe slide down a banner for good measure. The demo’s controls performed better than I expected, however. I was able to wall jump and wall run with only the click of a context button, and fighting only took a couple minutes to figure out before I was jumping, slashing, and dodging my opponent’s blades. I’d still like to see how some of the more technical aspects of the Prince’s arsenal are rendered on the iPad, but the current build looks on par with the 2004 release and played pretty smoothly. Let’s Golf 2 is coming to the iPhone this July. Featuring eight characters with their own powers and over a 108 holes of golf, Let’s Golf 2 looks to be better than the original Let’s Golf ( ) in every conceivable way. Graphically, the game looks cleaner and more detailed. From a gameplay perspective, everything gets an upgrade. You’ll be able to travel to six exotic locations including Aztec ruins, African jungles, and Greenland. I played a hole on one of the Greenland maps during the demonstration. My little golfer in his traditional golfing gear seemed out of place amongst the snow and icebergs that populated the level. Still, the swing mechanism was as easy as ever and I managed to hit the ball consistently far and true—unfortunately this landed me in the chilly water more than once. Other new features Gameloft will add to Let’s Golf 2 include new leaderboards and ways to challenge your friends, a new career mode, and new achievements to unlock. 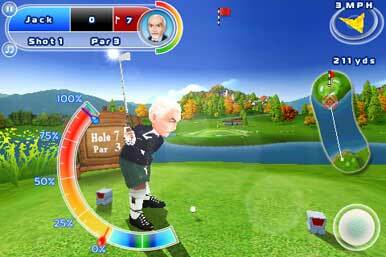 Let’s Golf 2 looks like a cartoonish, easy to pick up, and fun golf simulator that is sure to appeal to people of all handicaps. Generic Company Place Holder Let's Golf!